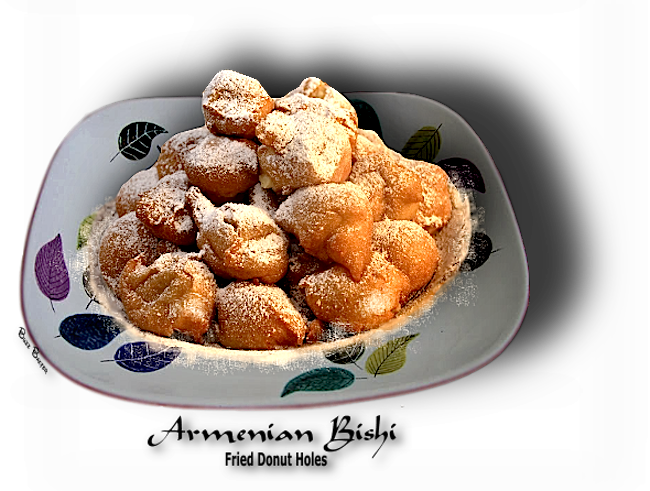 Armenian Zeppoli or donut holes. Bishi is a yeast dough and Tukalic is a baking powder dough. Every culture seems to deep fry leftover dough! 1. Dissolve yeast in warm water with sugar. 3. Add flour and salt to make a batter a little thicker than pancake batter. 4. Allow to rise in a warm spot until double in bulk. 5. Heat oil to 375ºF. 6. Drop by spoonfuls in hot oil. Keep them rolling around until browned. 7. Drain and serve with powdered sugar or maple syrup. Mix all ingredients thoroughly except oil. Heat oil in a 2-quart saucepan. Oil must be hot. Test by dropping a small amount of batter in hot oil. It should turn golden brown quickly. Drop batter using a tablespoon for each ball of dough, frying about 5 at a time. Remove each one as it turns golden brown like a doughnut and drain on paper towels. 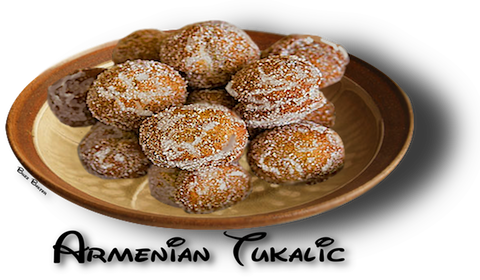 Cool to lukewarm and sprinkle with powdered sugar or serve with syrup or honey.